Welcome to the first hostel in the world on the 66Th floor! Make new friends, hit the sights and stay impressed with this bursting with colors and cultures Dubai while your stay at At the Top Hostel. 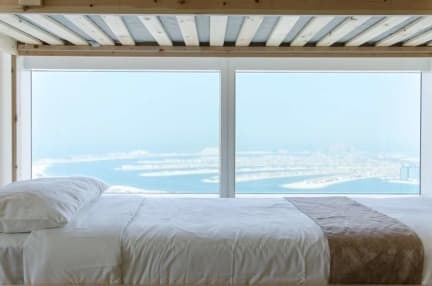 Whether it’s your first time in Dubai or not, but you’re ready to hit the sights and experience the electrifying Dubai nightlife, At the Top Hostel will be your comfy confines for rest and relax! 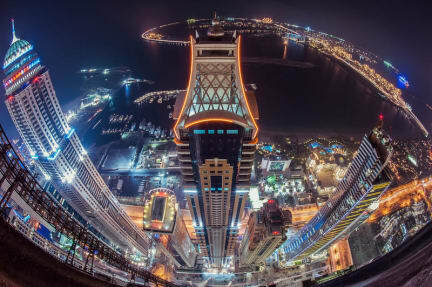 Perfectly located in the 24/7 alive Dubai Marina district you may do both: enjoy breathtaking views and reach all the main attractions of Dubai – you are able to choose any means of transport! Damac Properties Metro Station is only 10 minutes walking distance, Mina Seyahi Tram Station is just 2 minutes away from our building, and also taxis, water taxis, and bikeways will make it easy to access every other part of the city. Reception is opened 24/7 and our friendly multilingual team is always ready to provide guests with all the information needed during their stay and do their best to accommodate any requests. Delicious Continental breakfast is served in our spacious living room. Superfast Wi-Fi is included in the price and all the guests have access to a kitchenette (including kettles, toasters, fridges, microwaves and ovens). We will also provide you with clean linen, fresh towels and safe lockers! Vending machines and souvenirs shop, irons, hair dryers, bicycles for rent, printing and scanning services are available! Due to our housekeeping system, the place is kept spotless all day long! If reservation has estimated arrival time, it will be canceled in one hour after reserved check-in time. At check-in, guests must present a valid government issued identification (ie: driver’s license, state id card, passport). Guests will be asked for security deposit of AED 100 (approximately 30$), which will be refunded at the end of the stay upon return of the said items in their original condition. Cash payment only upon check-in at the property. Taxes included. Please, note the parties cannot be held. Guests under 16 permitted only in private rooms unless an entire dorm is rented. Please note we cannot guarantee multi-bed bookings will be accommodated to the same dorm. Group Bookings: Please, contact us directly for the group bookings. No group bookings can be made online. We accept maximum 6 persons by online booking. Please note that your booking may be cancelled if you make several separate bookings and the total number of the group will be more than 6. Famous Desert Safari tour, Helicopter's excursion, City Tours and many other activities at an additional cost! Absolutely amazing place to stay! Clean and convenient. Staff are absolute legends and amazing very helpful and understanding. Feel like home. Just a warning you might not want to leave here! Best hostel ive ever stayed at. Location ideal, right next to an ATM & 24 hr carrefour, opposite barasti beach bar and an amazing food spot ( shamis) round the corner. Lisa was soooo happy and freindly, she made the atnosphere very welcoming and the other staff whose names i dont know were also super freindly and welcoming. Facilities were great, incredible view, hot showers, comfy & clean. Highly recommend. Had an amazing time at this hostel close to metro so you can get anywhere. Staff very helpful. I didn’t think this would be as social due to the country but it was amazing met loads of people from all over. This place was amazing! Staff were incredible, place was super clean and location is perfect. To top it all off, the views were spectacular! 66th floor and a view of the palm. Tram is right out front, metro is 10 min walk, and the Marina, a 10 min walk as well. Truly the best hostel I’ve every stayed at! The location of the hostel is perfect for anyone who wants to live near Palm Jumeriah. The view from the common room is breathtaking. The hostel staff is super courteous and helpful. Had an amazing stay. this place was really nice the view is breath taking from the 66 floor and it was facing the ocean and the palm shaped villas the kitchen was too small only onr frig for the whoe hostel which was not enough but it was Ok. it is a nice stay I would stay there again if I have the chance. In general a very nice hostel and the breakfast is magnificent and worth paying for. Facilities are great and view is amazing. It’s in the south part of town so far from the airport and Burj Khalifa but close to marina and Palm Jumeirah. A lot of the lockers don’t seem to lock/work at all and are only big enough for valuables anyway. Vibe is ok though the hostel is split across multiple areas so kind of divided. All in all would stay again.